The human eye is a complex structure and generally consist of two parts . 1- sub-components 2- eyeball. 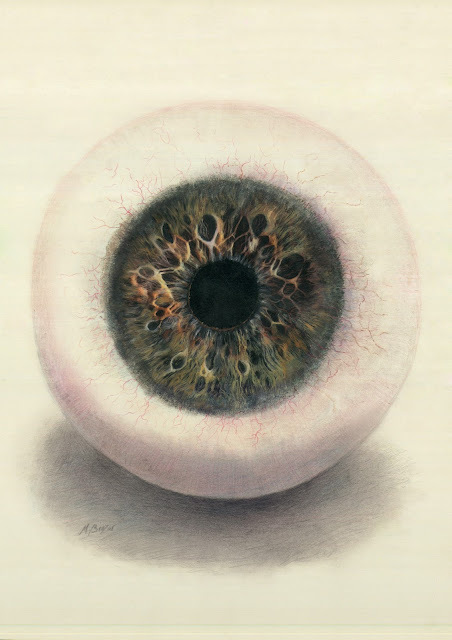 This image is the globular eye, and especially eye iris. We always consider our eye is smooth and polished sphere. the most detailed close-up images of the iris is like landscape of the volcanic crater cavitation. Iris word taken from Greek mythology is a goddess of the rainbow, because the iris can have many colors. our eye's Narrow ring structures that are called irises not only have responsible our eye's coloring, but on the other hand to control the thickness of pupils To determine what amount of light to reach the retina. Every day hundreds of eyes see but never do not recognize that this beautiful and wonderful structure surface has the surface like unknown planet.